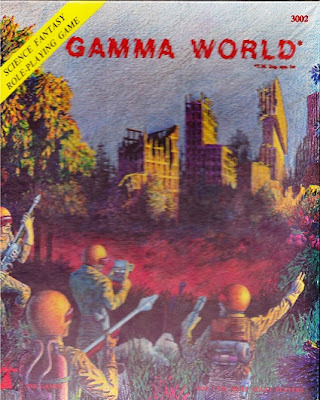 I have never played Gamma World. Not even once. I have barley even cracked open one of the books. It hasn't been out of lack of want, more it has never been in the same place I have been for any amount of time. Also, and this is the biggest deal, I don't own a copy of any of the 7 editions of the game. Though if I were to play it I would want to play the original first edition (pictured). Yes I know I have easy access to Mutant Future, it's not exactly the same thing is it. Very. very close yes, but not the same. Part of the problem, for me at least, came from the fact that GW was always the 70s view of technology and by the time I had thought about playing it it was the mid 80s. We knew then (and even when it was written really) that mutations don't happen like that. Trouble is I let that get in the way of what could have been a great time with a game. It struck me that the time is right for a Gamma World like game again. Post-Apoc (with or without Zombies) is fashionable again. Hunger Games, Revolution and even specials on History Channel are all about what to do during and after The End. What has has really got me thinking about shows like the obviously D&D and Gamma World influenced "Adventure Time". I did a couple of posts on the show a while back featuring the stars Finn the Human and Jake the Dog. Honestly if I were to ever play a "Gamma World" style game it would most likely be Mutant Future. 1st Edition Gamma World typically goes for a lot of money on eBay whereas Mutant Future can be had for under $25. But still. Having a copy of this would make for a nice addition to my game collection. I'll have to keep looking and find one at a good price. I do enjoy the challenge of finding an out of print game. Tim, thanks! Yes that is the one I have, but I prefer the art version myself and see it as worth the cash. MF is great and there is a lot to love about it. I loved Gamma World in high school. Even back then I thought the mutations thing was a bit silly but I didn't let it get in the way of my enjoyment of the game. It's nice to see the whole post Apocalyptic genre getting big. It's always been a favorite of mine.